1. the FTI TopBottom sign on top (or bottom). 2. the zig and zag arrow sign on top (or bottom). 3. PA must be cross down below T3 basic (or cross up above). As the PA below T3 indicator basic : iGentor LSMA&EMA, JMASlope, FXTrend, HeikenAshiSW_v2 (TF 1410) and FXFreedombar must be in red color to SELL. In the pictures FTI Scalping System forex system in action. 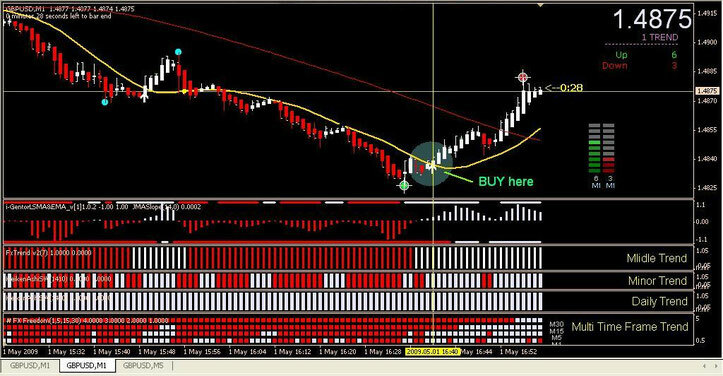 Trading System:FTI Scalping System based on more metatrader indicators as T3, JMASlope, FX Trend FXFreedombar, Heiken asci Sw.